Overall the album is a serene collection of songs that beckons listeners to surrender to the waves of tranquility that their music seems to exude from the first song to the last. The idea of pairing Doug Hammer and Amethyste might not be your first thought of what would constitute a great instrumental duet but in this case it was an excellent idea that yielded some wonderful compositions. The name of the album is Secret World which might mean something different to just about everyone who listens to the 12 songs that comprise this release but to me the meaning of Secret World gravitates to the idea that the compositions on this album are born from a place that lies deep within all of us that oftentimes we do not share with anyone else which sometimes even includes those closest to us in this life. It is a secret world of joys that we have experienced, hurts that have never quite seemed to heal and deep emotions that tend to make it difficult to share them with anyone else. The songs on this collection speak to that place deep inside and they offer us comfort, peace and understanding for those hidden things that are rarely revealed to others. One of my favorite songs on this album is entitled Moonflower and I like it because it is a delicate song that connects so completely with these secret worlds within that it could be set to play over and over and each time through it would caress your spirit with healing waves of sound that never seems to wear thin no matter how many times you hear it. Secret World is a quality recording that really emphasizes the talent that these two musicians bring to the project. 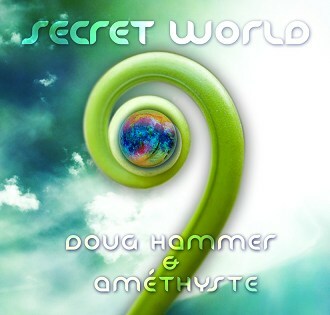 As with any collaborative venture it is essential that the two musicians approach the project with a unified view of where the music will eventually end up and it is clearly evident that Doug Hammer and Amethyste knew where Secret World was going from the first note to the very last. It is apparent that they not only recorded the music together but that the music became a unique reflection of the both of them playing together which made the final product greater than the sum of both of their contributions. Even though all the songs on this project were improvised it is obvious that Doug and Amethyste “knew” in their hearts what they wanted to communicate via the compositions that were born out of this moment of pure creation and judging by what you will hear when you play these songs they have surely succeeded in their goal. It is this melding of talents that makes Secret World a special album that is well worth owning and listening to again and again. Secret World is an emotional journey that allows the listener to spend some time being a little introspective while these soothing compositions speaks serenity to the spirit. All the song were created, improvised, produced and mixed by Doug Hammer and Amethyste. Ambient Visions recommends Secret World to our readers.